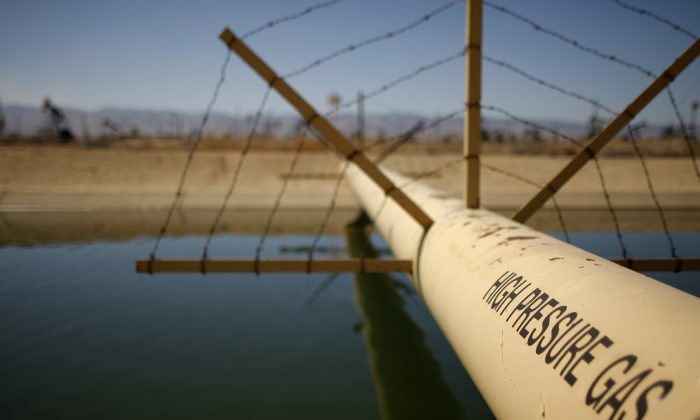 A file photo of a high pressure gas line crossing over a canal in an oil field where gas and oil extraction using hydraulic fracturing, or fracking, is being used. (David McNew/Getty Images). Wastewater from hydraulic fracturing (also known as fracking) has been spread over some New York State roads to melt ice in the winter and to control dust in the summer. It has also entered the state’s wastewater treatment facilities and landfills, which critics—including State Senator Brad Hoylman—say are not equipped to process it. 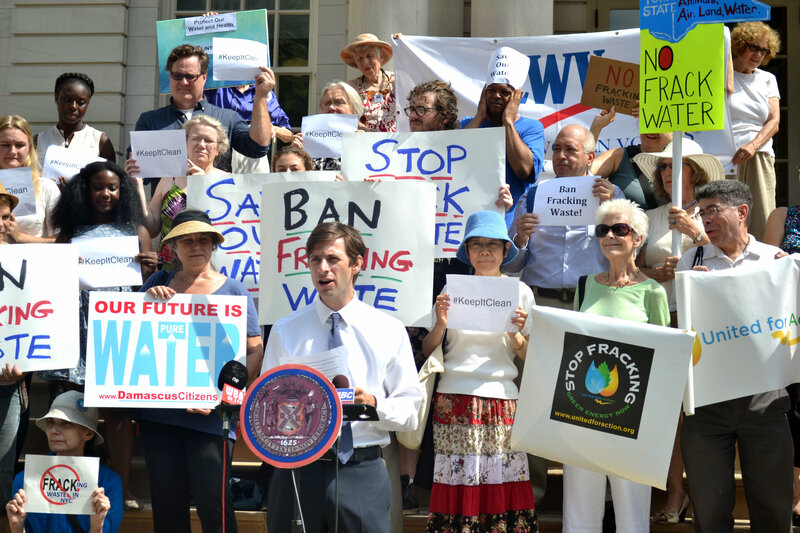 On Aug. 16, New York City Council voted in favor of Intro 446-A, sponsored by Councilmember Stephen Levin, which would ban fracking waste from the city. Mayor Bill de Blasio now has 30 days to sign it into law. The city is the first municipality in the country to impose such a ban, though some New York counties have taken similar measures to keep out fracking waste, since state and federal laws have allowed its dissemination. Fracking is the process of injecting water mixed with chemicals into the ground at high pressure to fracture rock and release natural gas into wells for collection. Although New York State has banned high-volume fracking (which typically uses 300,000 gallons or more), low-volume fracking continues and waste from these operations remains. Waste has also entered New York from surrounding states. Pennsylvania has prohibited its treatment plants from accepting the waste, and it has sent some 26,000 barrels of liquid waste to New York, according to a report by Environmental Advocates of New York. Some of the concerning materials in the waste include naturally occurring radioactive materials (NORMs) and carcinogens like benzene. Liquid fracking waste is generally classified into two categories. One is flowback fluid, which is the fluid pumped into the ground that later returns to the surface. The other is production brine, also called produced water, which is a naturally occurring salty water brought up from underground. The production brine is what is used on the roads. The U.S. Environmental Protection Agency (EPA) has warned against this use. In its evaluation of New York’s environmental impact statement on high-volume fracking, the EPA said the brine may still contain chemicals used in the fracking process. It also said that some of the natural products that are brought up from deep underground during fracking may be present in dangerously high concentrations. Levels of NORM can vary widely even within a single well, necessitating the testing of each truckload of wastewater. Before spreading the brine on roads, municipalities or private companies have had to obtain approval from the state’s Department of Environment Conservation (DEC) in the form of a “Beneficial Use Determination” (BUD). Advocacy organization Riverkeeper analyzed these BUDs and found that, since 2011, brine has been approved for use on roads in portions of at least 41 municipalities in nine New York counties and for use on state roads in portions of at least 10 counties. In issuing BUDs, the DEC has taken into account various factors, such as the distance of application from groundwater sources and the number of applications. The DEC has taken into account various factors, such as the distance of application from groundwater sources and the number of applications. For example, an approval from 2011 states that brine should not be administered to roads within 50 feet of a stream. Yet, as the non-profit news outlet New York Environment Report pointed out, the benzene levels in this case were three times the standard put forward by the state. According to Riverkeeper, 15 counties in New York have banned fracking waste to date, including neighboring Nassau and Westchester Counties.